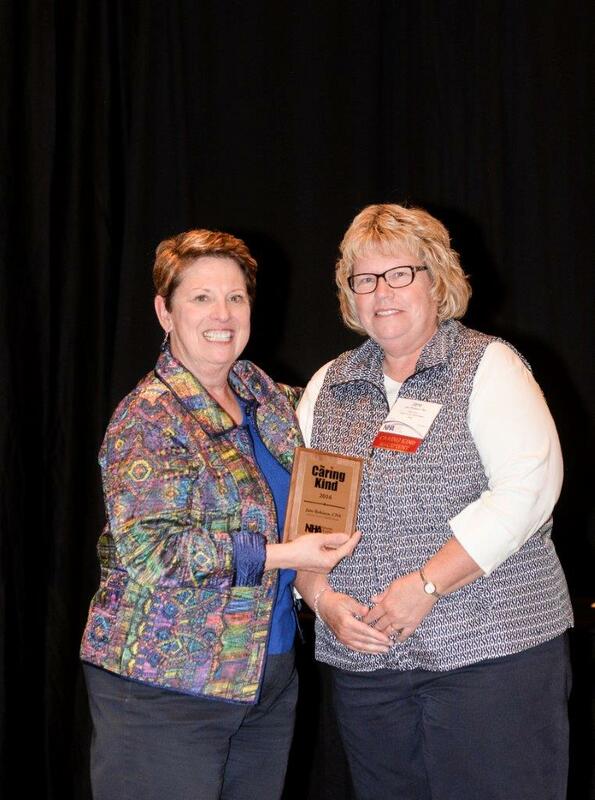 Jane Robison, CNA and Ward Clerk at Harlan County Health System has been chosen by her co-workers to receive the 2016 Nebraska Hospital Association Caring Kind Award. Katie Fleischmann, Director of Nursing at Harlan County Health System stated: “Jane is well deserving of this award. She exemplifies the meaning of caring and kindness. We are so fortunate to have her as a member of our team.” Jane has been a member of the HCHS family since November of 2008. Jane goes above the call of duty without being asked. She takes time out of her day to bring flowers to patients or gifts to patients on Christmas and tells them it’s from all of the HCHS Staff. Jane is the type of person who lights the room up with her smile. She comes to work with a smile on her face and she is always willing to help others, Rather that person is a co-worker or a patient. Jane goes out of her way to purchase personal supplies for patients who may not have such items at their own home. To nominate Jane is an easy decision as she is one of the most kindhearted, selfless, and giving. It’s a joy working with her as she makes every day that much better. 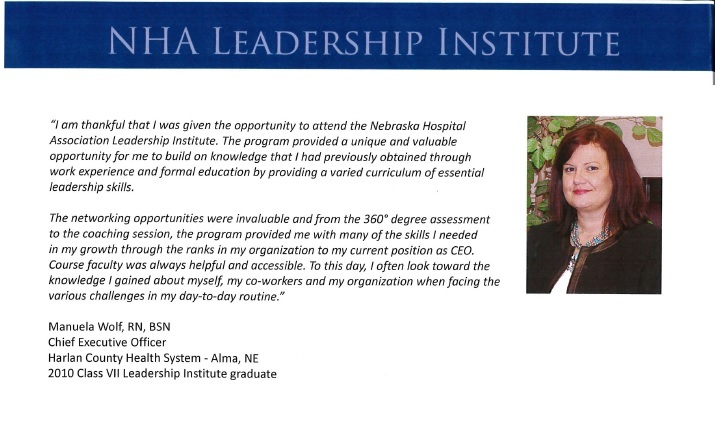 She has helped multiple areas of our facility, including nursing staff, office staff, outpatient, and in the kitchen. She is vital employee and truly one of the most compassionate employees at HCHS. Congratulations to Jane on this very prestigious award. An anonymous local donor has pledged $100,000 to the Harlan County Health System Foundation’s campaign, Quality Care… Building on Excellence. So far this is the largest gift that has been made to this campaign. Individuals that contribute to the campaign are making an investment that will allow the health system to bring enhanced quality treatment and efficiency to the patients and to entice new providers to join the practice and the community. 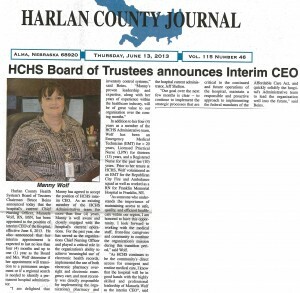 HCHS CEO Manuela Wolf commented: “This is great news for Harlan County Health System. I would like to thank this incredibly generous donor and would ask our community members to follow the example of this very committed supporter of health care in our community and contribute to this great cause. This will allow us to continue to deliver high quality healthcare close to home for many more years to come.” Foundation Board Chair Becky McKenzie stated: ”We are lucky to have community members that are willing to donate in order to help provide better access to healthcare right here in our own community”. This capital fundraising campaign is designed to generate charitable support to offset the costs of replacing the current Alma clinic, which has served Alma and the surrounding communities for the last 45 years. So far the campaign has raised $406,441 in donations and commitments by community members, employees, area businesses and organizations. Thank you to the many people who have already donated during this first-ever fundraising effort. To make a donation, please call the foundation at (308) 928-2151 or contact them online at foundation@harlancohealth.org. 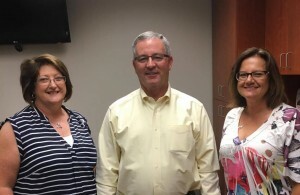 During his visit to Alma on June 20th, Senator Dan Hughes took the opportunity to visit with Harlan County Health System leadership to learn about the current state of healthcare in Harlan County and to discuss barriers in the provision of healthcare in rural Nebraska, specifically here in Harlan County and the surrounding areas. Topics discussed included how the health system ensures that high quality and efficient care is provided to our patients, challenges in behavioral health that are a concern not only in this county, but throughout the State of Nebraska and the provision of care to residents that are not currently eligible for public assistance programs. HCHS and many other healthcare providers are facing difficulty in the current practices of the Medicaid and Medicaid Managed programs and we are looking toward our legislators to assist with this process. The expected workforce shortages in nursing and other allied health professions, as well as in non-clinical area are a concern that HCHS, along with many other employers is facing. Manuela Wolf, HCHS CEO stated:” In the coming years it will be increasingly important to have strategies to address these shortages, both on a local level and also in the legislature by offering incentives and education assistance for workers to choose employment in rural settings.” Recruitment and retention in health care, especially in rural Nebraska were important topics during the conversation with Senator Hughes. During the visit we also had opportunity to discuss the Health System’s Capital Campaign to replace the current medical clinic and received input from Senator Hughes regarding available funds through USDA programs. It is important to the future of healthcare, especially rural healthcare to be in close contact with legislators and their staff to make them aware of the difficulties that we face. One of the most powerful tools available to constituents is a personal call, visit or letter to their elected officials. Elected officials want to be responsive to their constituents, so as concerned citizen it is important to know who your representatives are, let them know who you are and be a resource for them by sharing information in addition to sharing concerns and requests. HCHS leadership is grateful for the opportunity to visit with and inform Senator Hughes of our ongoing concerns. Harlan County Health System recognized in Top 20 US Critical Access Hospitals, naming them a “Best Practice” Hospital in the category of Patient Satisfaction. The 20 highest ranked critical access hospitals (CAHs) in the country, as determined by iVantage Health Analytics, were recently announced by the National Rural Health Association (NRHA). 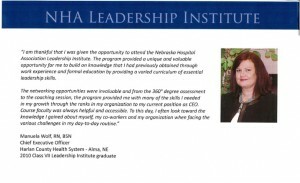 Harlan County Health System merited a Top 20 Best Pr...actices in Patient Satisfaction designation from the National Rural Health Association; this means that the hospital was ranked in the Top 20 for Patient Satisfaction among all Critical Access Hospitals in the U.S. Only four other hospitals in Nebraska were designated in the Top 20. Other designees were from the States of MN, OH, TN, MN, N.Y., TX, MA, UT, OK, CA and WA. 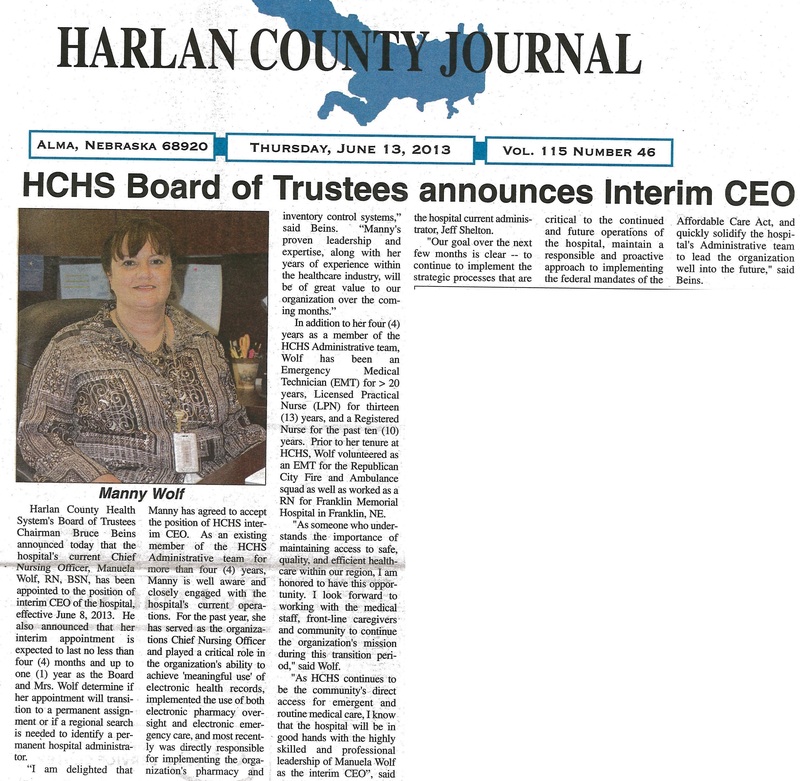 Manuela Wolf, CEO of Harlan County Health System stated: “The mission of Harlan County Health System is to be dedicated to providing the highest quality patient care experience with focused attention to patient safety, value and an uncompromised commitment to clinical excellence for those we serve. The receipt of this award shows that our staff is committed to fulfilling this mission every day.” The survey that is used to determine the winners of this designation utilizes patient satisfaction surveys sent to the patients of the health system. Questions asked in the survey touch upon every aspect of the patient stay. Not only the care given by physicians and nurses is rated, but also quality of the food, the cleanliness and quietness of the facility, pain control, patient involvement and many other parts of the patient stay. This means that receipt of this designation does not only show that the clinical staff at Harlan County Health System does excellent in caring for the patients, but that every single staff member is a part of this great group of employees and is responsible for the excellent care that is given. Give the gift of health and safety to yourself and others by following these holiday tips. You can sing along in The 12 Ways to Health Holiday Song, listen in a holiday health podcast, and send the song to your friends and family in a holiday health-e-card! 3.Manage stress. Don't over-commit yourself and prevent holiday anxiety and pressure. 4.Don't drink and drive or let others drink and drive. 9.Monitor the children. Keep potentially dangerous toys, food, drinks, household items, and other objects out of kids' reach. Make sure toys are used properly. During the holiday season, and year-round, take steps to make sure that you and everyone you celebrate with avoids driving under the influence of alcohol. Following these tips can help you staSpread the word among your friends and family about tips to keep kids safe on the road. Send a health e-card to help them protect the ones they love. Don't let friends drive if they are impaired. If you're hosting a party this holiday season, remind your guests to plan ahead and designate their sober driver; offer alcohol-free beverages; and make sure all of your guests leave with a sober driver. •Extend your teen's supervised driving period. Help your teen develop the skills he or she needs by providing as many supervised practice driving hours as possible. Include at least 30 to 50 hours of practice over at least six months. Make sure to practice on a variety of road conditions and at different times of day. •Set the rules of the road. Practice driving will empower your teen. But your rules will provide much needed limits to keep him or her safe. ◦Make sure your teen always wears a seat belt. ◦Limit your teen's nighttime driving. ◦Restrict the number of teen passengers allowed in the car. •Enforce the rules with a Parent-Teen Driving Agreement [PDF - 1.55 MB]. Discuss your rules of the road with your teen. Talk about why they are important to follow, as well as consequences for breaking the rules. Work with your teen to draft and sign a parent-teen driving agreement. You may choose to hang yours on the refrigerator door to highlight the importance of safe driving. Let your teen know that following the rules and driving safely will result in greater driving privileges. Learn more about CDC's Parents Are the Key campaign and research and activities in this area.